Cylinder seals were impression stamps, often quite intricate in design, used throughout Mesopotamia. Among the most interesting and revealing artifacts discovered from ancient Mesopotamia are the objects known as cylinder seals. These fairly small items may be seen today in museum exhibits around the world but, perhaps owing to their size, they are not given the kind of consideration by the general public which larger and more commanding artifacts, such as reliefs or statuary, enjoy. The cylinder seal, however, was an integral part of daily life in ancient Mesopotamia and tells the story of the people more completely than royal reliefs or towering statues ever can. Cylinder seals were impression stamps, often quite intricate in design, used throughout Mesopotamia. They were known as kishib in Sumerian and kunukku in Akkadian and were used by everyone, from royals to slaves, in the transaction of business and sending correspondence. They originated in the Late Neolithic Period c. 7600-6000 BCE in the region known today as Syria (though, according to other claims, they originated in Sumer, modern Iraq, sometime later) and were made from semiprecious stone (such as marble, obsidian, amethyst, lapis lazuli) or metal (gold or silver). These seals were worn by their owners on strings of leather or other material around the neck or wrist or pinned to a garment. Their purpose was to serve as a personal signature on a document or package to guarantee authenticity or legitimize a business deal as one signs a letter or form in the present day. The seal was rolled onto the moist clay of the document as an official, binding signature. Contemporaneous with cylinder seals were stamp seals which were smaller and less ornate in design. The typical cylinder seal was between 3-4 inches (7-10 cm) long while stamp seals were less than an inch (2 cm) total and more closely resembled the later signet ring. While some scholars (such as Dr. Stephen Bertman) claim the stamp seal preceded the cylinder seal, others (such as Dr. Gwendolyn Leick and Dr. Senta Green) claim that the two seals were used contemporaneously. The claim that the stamp seal came first would seem to make sense as it is a less refined means of sealing a document, and one would logically assume that the more refined and ornate cylinder seal developed from the more primitive stamp seal. 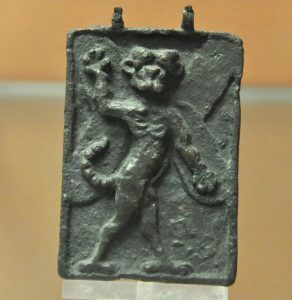 While that may be, evidence suggests that stamp seals were popular throughout Mesopotamia at the same time as cylinder seals, and especially in the regions known today as Syria and Turkey. Stamp Seals and Cylinder Seals: Which Came First? The question of whether the cylinder seal replaced the stamp seal or simply became more popular comes into play owing to disagreement among scholars as to what, precisely, was being sealed. Some scholars argue that cylinder seals developed from stamp seals owing to the need to seal bullae, hollow, rounded balls of clay which held tokens representing a financial transaction (for example, four white pebbles to represent four sheep), while stamp seals were used to secure flat clay envelopes which would be broken open upon receipt. The flat envelopes, the theory goes, were used before the development of the bullae, and so the stamp was an efficient means of securing a message or transaction. With the development of the bullae, a seal which could be rolled onto rounded clay was required, and so the cylinder seal developed. 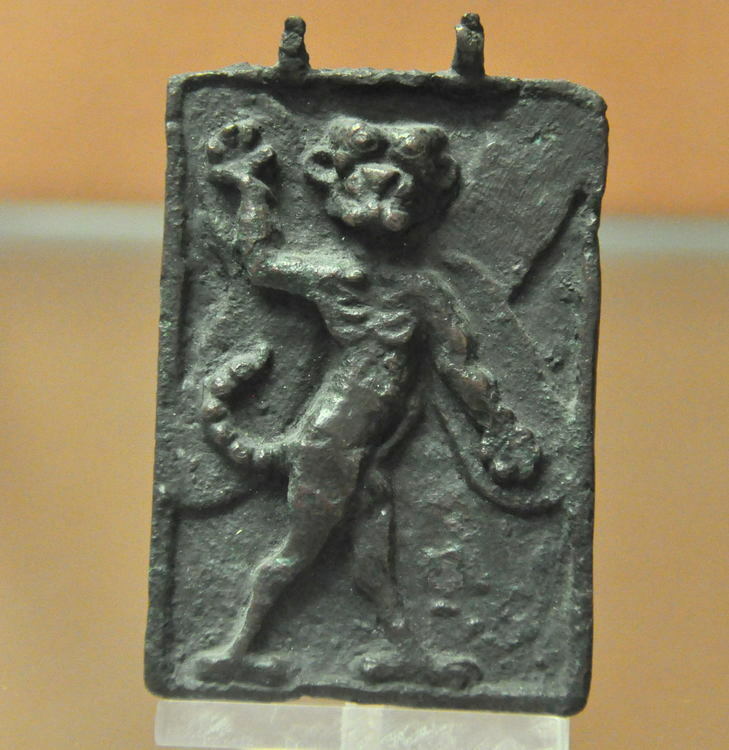 The problem with this theory is that the broken envelopes discovered in the present day are clearly stamped by cylinder seals and that there are bullae which were marked by stamp seals. The safest answer seems to be that, while the stamp seal may have preceded the cylinder seal, the stamp continued in use perhaps owing simply to personal attachment. Bertman notes that cylinder seals “sometimes became heirlooms and as such were passed on from one generation to the next” (231). The same situation could have been the case with stamp seals, except that one must consider the very wide-spread use of stamp seals as opposed to cylinder seals in ancient Syria and Turkey, both of which used both on bullae and clay envelopes. It seems to make sense that the cylinder seal developed from the stamp seal, and perhaps it did, but one cannot argue this claim conclusively. The archaeological evidence makes clear that both kinds of seals were used by the people of Mesopotamia and were used for both envelopes and bullae containers pre-dating the invention of cuneiform writing. 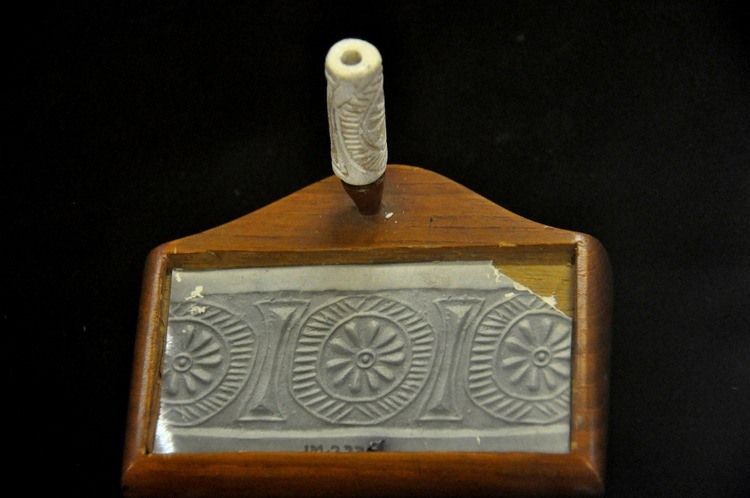 Unlike the northern sealing tradition of using stamp seals, southern Mesopotamians used cylinder seals, consisting of stone cylinders into which seal designs were engraved. The difference between stamp seal and cylinder seal is much more than a technical one and, in fact, tells us about the very nature of scribal agency behind the seal. The limited space on the reverse side of a stamp seal also limited the potential variability in the iconographic repertoire of seal designs. Accordingly, the number of easily discernible variations on a theme is limited. The surface of a cylinder seal, by comparison, provides the “canvas” for a long rectangular image, making it a perfect place to apply an elaborate design with “narrative” depictions. Sufficient room meant that the same theme easily could be varied without confusion or mix-up. This medium, therefore, suited the requirements of an increasingly complex bureaucratic entity which required subtle details to identify individual agents within its system (34). As the bureaucracy of Uruk (in Sumer) and the rest of southern Mesopotamia was more complex and widespread than that of the north, relatively speaking, it would make sense that southern Mesopotamia would have favored the cylinder seal while the stamp seal remained popular in the north. It also resolves the issue of where the seals first originated since Sumer would have developed the cylinder seal and ancient Syria the stamp seal owing to their respective needs. The cylinder seal came into popular use during the fourth millennium BCE in the Middle and Late Uruk Period. The rise in bureaucracy during this period necessitated the kind of guarantee of authenticity which these seals provided and, in time they became increasingly intricate in design and scope. Unlike the smaller stamp seals, cylinder seals provided an artist with the room to explore a certain motif. These motifs not only make clear the identity of the individual who bore the seal but give significant details about their jobs and way of life. Leick writes, “The pictorial scenes that refer to activities such as weaving, attending domestic animals, hunting, and apparently ritual actions may indicate spheres of administrative competence within the Uruk economy” (47). This “administrative competence” was demonstrated through the sophisticated work of the artists who created the seals. Cylinder seals were made by a sealcutter known as a burgul in Sumerian and as a purkullu in the Akkadian language. One apprenticed with a master sealcutter for four years minimum before setting up one’s own shop as a professional. Stephen Bertman writes of a sealcutter’s toolkit found in the ruins of the ancient city of Ugarit, Syria: “In a clay jar were found a small copper chisel, two pointed copper gravers (for detail), a whetstone, a borer (for drilling holes), and some seals that had not yet been completed” (233). The sealcutter also used bronze and flint engraving tools as well as drills and blades to work the stone into a seal. Bertman claims that “rather than cutting rough cylinders from stone, the sealcutters may have bought blanks from dealers, adding the finishing touches in their workshops” (233). If so, this would mean there were two types of artisans at work on the seals: those who crafted the blank cylinders from quarried stone and those who did the intricate engraving to personalize the cylinder for a customer. At some point in the process, either when the blank was created or after it was engraved, holes were drilled into the cylinder so that the owner could wear it on a string or pinned to a garment, as Bertman notes, “just such a pinned seal was found resting on the skeletal chest of Queen Puabi in her grave at Ur” (233). The seal of a queen like Puabi had a gold cap at one end fastened on with bitumen while those of less noble status would have their seals capped with less expensive metal. 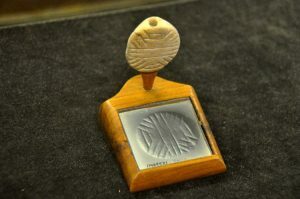 The seals were carved in intaglio, a process of carving beneath the surface of the stone so an impression of that carving creates an image in relief. The easiest way to think of this is as a photographic negative. In order to achieve this effect, the artist would have had to reverse the image he wanted in his mind and carve accordingly. This required enormous skill and sealcutters were highly paid and greatly respected for their craft. 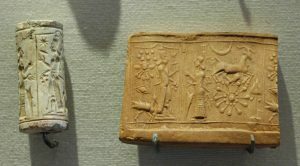 There was no shortage of demand for cylinder seals by the people of Mesopotamia. 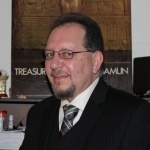 Bertman notes how “2,000 cylinder seals have been recovered” in Mesopotamian digs thus far and that “based on the theory that for every archaeological object in a museum at least a hundred still lie buried, some 200,000 such seals from [the Uruk] period alone still await excavation” (231). The sealcutter, therefore, was very much in demand and a highly skilled cutter would have lived very comfortably. The Uruk-style seals show animals and figures depicted in an exceptionally naturalistic fashion, suggesting that the seal carvers were aiming for expressive clarity. The motifs include ritual narratives involving temples, boats and offerings to gods, as well as depictions of the natural world in hierarchical arrangements. They are skillfully cut, detailed, and their composition tends to be balanced and aesthetically pleasing. The Jemdet Nasr-style seals are less detailed than Uruk-style seals and are characterized by the heavy use of drills and cutting discs, which produce round and linear marks respectively. Common motifs from the Jemdet Nasr-style include women with pigtails involved in domestic labor and herds of animals in front of temples (4). The Uruk-style seals were property of, and used to identify, individuals, making it necessary for each seal to be visually distinct (Nissen 1977: 19). They were used to authorize transactions and control the movement and storage of goods (Nissen 1977: 20). As they were more complex and therefore time-consuming to produce, Nissen argues that they were property of elite members of society who were at the top of the administrative hierarchy (Nissen 1977: 20). In contrast, he suggests that the Jemdet Nasr seals were used to identify a ‘legal person’ such as an institution, and not a private individual (Nissen 1977: 19). In this case, it was less crucial for different seals to be distinguishable from each other, which allowed the use of repetitive motifs (6). The uses of the seals were both practical and spiritual. The Lewis and Feldman list above addresses the practical use of signing one’s name, restricting access only to those allowed to break the seal, and as a means of personal identification, or a kind of badge of authority or specialized occupation. The third use listed, ‘amuletic’, refers to the Mesopotamian belief in the seal as an amulet, a kind of charm, which could ward off evil spirits and protect one from harm. The seal could also work as well to bring one luck and prosperity. A seal may have been engraved with a certain scene from a story or legend about the gods or perhaps with an image of a demon, which would have meant ‘powerful spirit’ and did not have the universal negative connotation it has today. The demon Pazuzu, for example, was a frightening looking creature but protected pregnant women and their unborn children from harm if they were wearing an amulet with his face carved on it. Although most people who have heard of Pazuzu today associate him with evil, owing to the 1973 Hollywood film The Exorcist, he was a guardian of human beings, even going so far as to draw the worst smells away from the cities and out into barren areas to dissipate. Whatever the use one put the seal to, it was a prized possession and its loss was taken as seriously as one today would view the loss of their credit cards. Bertman writes how, after finding one had lost one’s seal, “the former owner would record the date and time of loss with an official to insure that transactions made after the loss would be invalid” (235). As noted above, some seals depicted one’s occupation but others were more intimate and revealed one’s personal identity, even one’s name. It is no wonder, then, that people were so worried over the loss of their seal. One’s personal identity was made clear either by the likeness engraved on the seal or by symbols surrounding an image. For example, if one were a weaver one’s occupation would be symbolized by a spider (which weaves a web) and symbols around the spider image would give the individual’s name. In the case of such seals, then, the loss would have been as serious to an ancient Mesopotamian as the loss of one’s personal identification is today and the threat of “identity theft” just as great then as it is now. Specific families, administrative department, or specific events related to the administration. Different stages of the administrative hierarchy, the object or persons involved in the transaction. The owner or the user of the seal, or details of the transaction – the commodity in question, its source or destination, or a specific event relating to its use. The ancients were intimate with something that more and more has come to characterize our lives today: impermanence. In a land where a raging flood could wash away an entire city, the ancient Mesopotamian understood that few things – including life itself – are guaranteed and secure. Gilgamesh, we remember, held the fragile secret of eternal life in his hand only to see it snatched away. For the people of Mesopotamia then, the stone cylinder seal was the ultimate symbol of permanence in an impermanent world. Perhaps that is why it occupied such an important position in their lives and was worn as a badge of honor (235). Cylinder seals in the present day continue to intrigue and fascinate scholars, historians, and any who pause to spend time with them in the exhibits at the many museums around the world. Cylinder seals hold such fascination because they are a glimpse into the past, not just of a civilization, but of an individual who lived and worked and worried over and enjoyed life in much the same way as people do today. Engelhardt, J. Agency in Ancient Writing. (University Press of Colorado, 2012). Pritchard, J. B. The Ancient Near East, Volume I. (Princeton University Press, 1958). This entry was posted in Ancient, Art History, History, Mesopotamia. Bookmark the permalink.